Are you running a travel-related business? Want to be a step ahead of the competition? The most successful hotels and travel businesses step up their game by having their own website and extending their reach online. If you want to be the next big thing in the travel industry, why not follow the steps of these highly successful businesses by building your own site, too? WordPress is undoubtedly the best platform to build your website on. Not only is it popular, it has a huge community where you can easily get the help and support you need, plus a huge collection of plugins that you can use to extend your site’s functionality. On top of these, WordPress also has an extensive repository of themes – both free and premium – that you can use for just about any kind of blog or website. 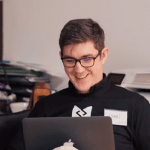 You’re definitely spoiled for choice with WordPress! If you want to bring your services closer to everyone around the globe, then you need a travel WordPress theme that’s not only responsive but also has all the features you need to build a fully working hotel or travel website. 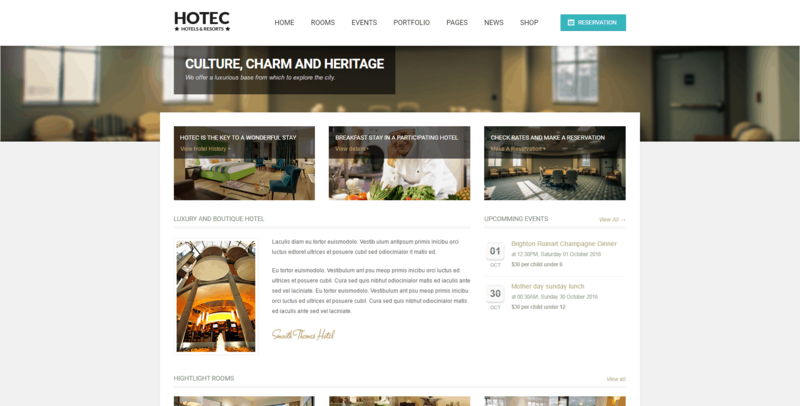 One such theme that allows you to be creative is the Hotec – Responsive Hotel, Spa & Resort WP Theme. In this Hotec – Responsive Hotel, Spa & Resort WP Theme review, we’re going to delve deep into this ThemeForest best-seller and find out whether it really is a theme for every successful travel website. Is it worth the price? Does it come with the right features and functions? What are the pros and cons? 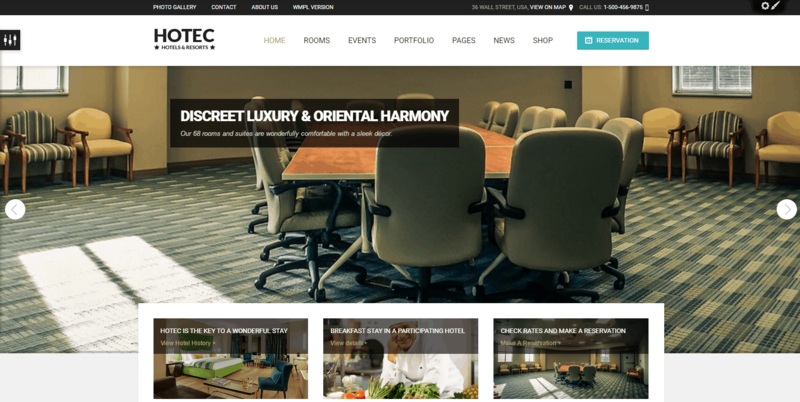 As the name suggests, the Hotec – Responsive Hotel, Spa & Resort WP Theme is a sleek, modern and clean premium WordPress theme that’s built with hotels, spas, resorts, travel agencies, and other travel-related businesses in mind. The theme is developed and designed by ThemeForest Elite Author, SmoothThemes, which is known for creating top-quality premium themes for creating beautiful, engaging websites. Hotec is easy to use and highly customizable. 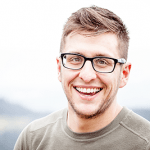 With a few tweaks, you can use it for personal blogs and even corporate websites. It has a fully responsive design so it responds seamlessly to any device screen size, making it look stunning on PCs, laptops, tablets, and smartphones. The theme also comes packed with premium sliders, theme customization options, an AJAX reservation form and event calendar, WooCommerce integration, and many more. With these amazing features, you know you can easily build a website for your travel business and be a step ahead of the competition! The Hotec – Responsive Hotel, Spa & Resort WP Theme is a feature-rich WordPress theme that comes with everything you could possibly need to build a powerful website for your travel-related business. 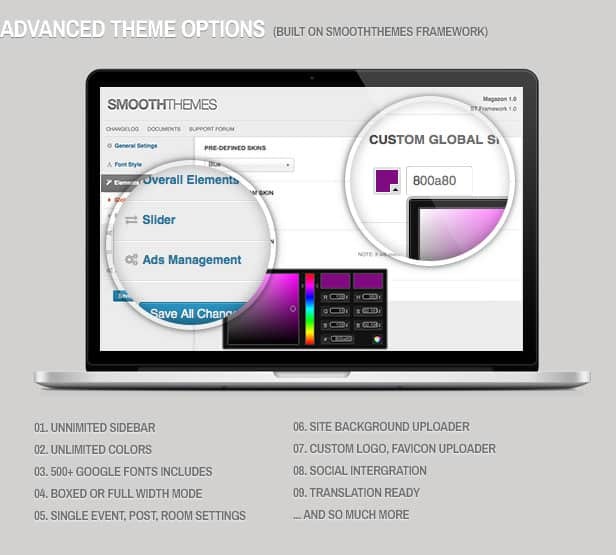 It comes with a smart drag-and-drop page builder that lets you set up custom page layouts and functionality, as well as styling options that allow you to set the color scheme (choose from 10 predefined colors), layout style (full width or boxed), patterns for boxed, background images, background color, and many more. The sky’s the limit for this theme and it’s one of the most easy-to-use travel WordPress themes in the ThemeForest marketplace. Other features worth mentioning are the handy “organizers” that add more functionality to your site and make the overall customer experience smoother and more convenient. 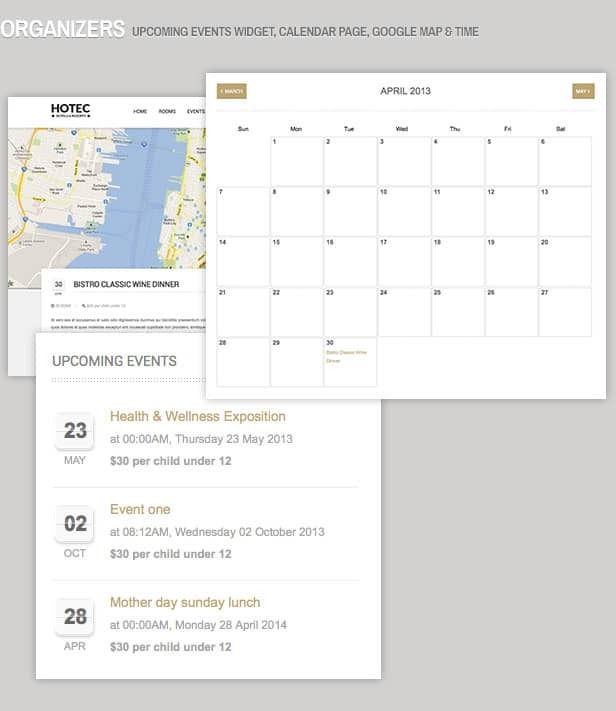 Hotec includes widgets for Upcoming Events, a Calendar page, as well as Google Map and Time. Now, you can display all your special offers, announcements, and events that are going to be held in your hotel, resort, or spa so others will know. Besides these, the theme also has a page for Rooms where you can showcase available rooms, including the pricing, services and amenities, the room’s features, along with more details about the room. There’s also a News page where you can share the latest news in your business niche, including offers and promos. 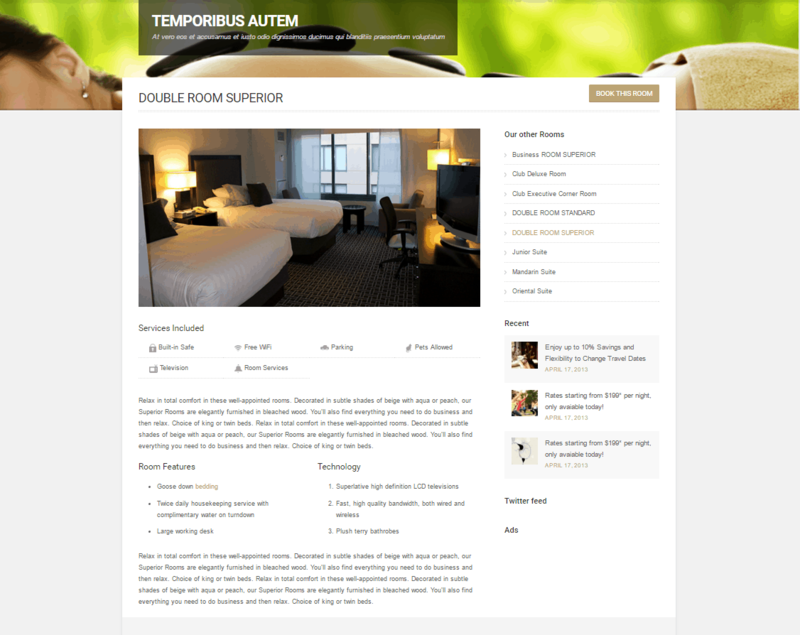 The theme even has an option Shop page where you can showcase any product you’re selling in your hotel, resort, or spa. Hotec is WooCommerce ready, which means you can easily add a shop to your site where you can promote and sell your wares efficiently and attractively. It’s also translation ready so you can cater to a wider audience by letting your guests and visitors use their preferred language while browsing your site. The theme also comes with premium plugins like LayerSlider and Revolution slider so you can effectively showcase your best services upfront. Premium WordPress themes almost always come with top-quality support from the theme author. Help and support is typically offered through live chat, forums, email ticketing, etc. Many premium themes these days also throw in tutorials into the package to help users. Unlike free themes that come with very limited features, premium themes are packed with awesome features like a built-in admin panel where you can control everything in the front-end, on the fly. Premium themes like Hotec also include premium add-ons, social media support, as well as SEO features that will help your site rank higher in search engines. Premium themes pay close attention to details, which is why most of them have stunning designs that will make your site stand out from the rest. Hotec comes with various layouts and gives you the ability to customize the color scheme and fonts based on your needs and preferences. Premium theme developers make sure to update the theme on a regular basis to fix bugs, to strengthen security, to catch the latest design trends, and to be on-par with the latest version of WordPress. This is not always available in free themes, so you might be putting your website (and business) at risk! Premium WordPress themes are obviously not free to use, and you need to get a license to use them. Prices may vary from one theme store to another, usually ranging from $50 to $300 (sometimes even more). Therefore, a premium theme might not be an ideal choice for those who have limited budget or those who are only looking to build a website or blog as a hobby. Premium theme authors claim to provide “lifetime support”, which means support only until the existence of the theme author. 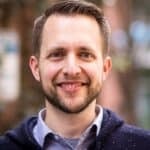 Some theme providers simply abandon a product without further notice, so you need to carefully check their history and reputation before investing on their product. Even though documentation and support are available, some people might find the theme difficult to configure. Because there are lots of features and options, it might take more time to configure all of them. 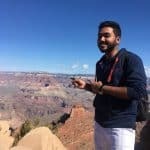 Some paid themes even suffer from “theme bloat” when developers throw in features that may be unnecessary to some users. 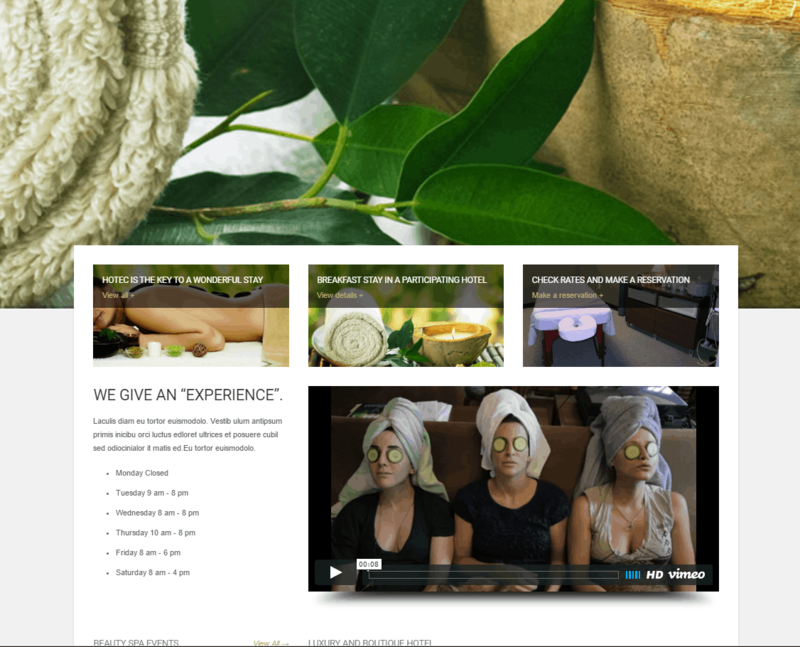 Obviously, we absolutely love the Hotec – Responsive Hotel, Spa & Resort WP Theme. It focuses on sharing content beautifully and effectively, which is a great call on their side. No matter if it’s text, images, or videos, all content is highlighted in a way that it commands its own space. Integrating theme features to only a chosen few and doing them really well is something not all premium theme developers understand. Instead of overwhelming users with countless of tools and customization options, they settled with only the most useful ones, which makes absolute sense. But for those who want additional functionality on their site, Hotec also offers a great starting point for customization and making your own. So if there’s a theme for every successful travel website, the Hotec – Responsive Hotel, Spa & Resort WP Theme is surely the answer!